Range Zero degrees to 220 degrees F.
Has a one inch dial and a 5 inch stainless steel stem with a carrying case that has a handy clip to fit in and attach to shirt pocket. Due to plastic lens, these can not be left in oven! 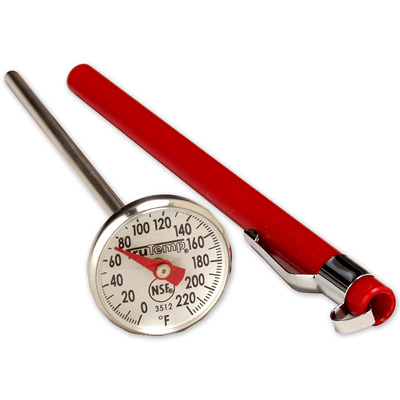 Designed to check internal temperature of meat that is being cooked or smoked.